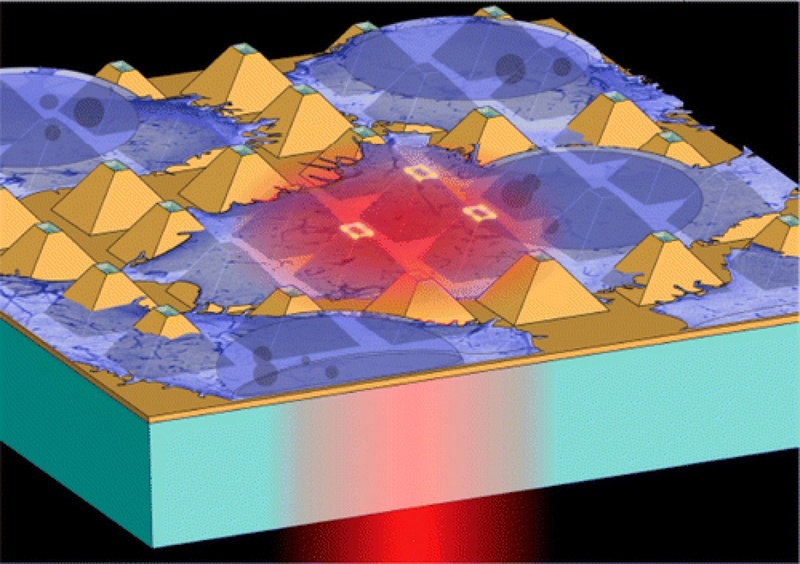 Plasmonic Tipless Pyramid arrays for Cell Poration. Gold nanoparticles promise potential improvements in cancer treatment, drug delivery, and gene therapy—with one, major problem. In order for the particles to destroy a tumor or create holes in cell membranes to deliver DNA, they need to be irradiated with a high-powered laser. This process excites the nanoparticle's electrons and generates localized surface plasmons, which increases the electric field close to the surface of the particle. These super-excited nanoparticles can do all kinds of things, such as increase the temperature of water and destroy cells. But the irradiation process can also damage the nanoparticle, splintering off tiny, but potentially toxic, pieces of gold. Even the smallest spec of free-floating gold can wreak havoc in cells and cause genetic mutations. To overcome this problem, Harvard researchers are developing the next generation of gold microstructures, replacing the free-floating particle with pyramid-shaped gold structures anchored to a flat surface. These microstructures are more stable than traditional nanoparticles and focus laser energy into intense electromagnetic near fields. This new platform was developed in the labs of Eric Mazur at Harvard John A. Paulson School of Engineering and Applied Sciences (SEAS), and Jean-Pierre Wolf at the University of Geneva, Biophotonics group. It is described in a paper published in the journal Nano Letters. Courvoisier, S., Saklayen, N., Huber, M., Chen, J., Diebold, E.D., Bonacina, L., Wolf, J.P., and Mazur, E. (2015) Plasmonic Tipless Pyramid s for Cell Poration. Nano Lett 15, 4461-4466 (10.1021/acs.nanolett.5b01697) Courvoisier-20151 (4.51 MB) .